What will John Brennan do, Suspend his operations? This image — captioned, “President Barack Obama talks with CIA Director John Brennan, center, and Chief of Staff Denis McDonough in a West Wing hallway of the White House, May 10, 2013” — may officially be my new favorite official White House photograph. In other words, John Brennan was speaking to Obama and the Chief of Staff about CIA’s complaints about the SSCI Torture Report on May 10. And White House photographer Pete Souza had framed the event amidst reflections and dark lighting that would make even James Jesus Angleton weep. I’m fond of the photo, too, for what it shows. As you recall, SSCI’s torture report was completed last December. CIA was initially supposed to respond to SSCI about the report by February 15, but that got held up, in part, because of Brennan’s confirmation, during which he appeared to avoid reading the report to avoid saying anything about it before being confirmed. Almost immediately after Brennan was confirmed, the CIA started leaking about how much they didn’t like it (even while claiming they still hadn’t finished reviewing the document). It turns out those leaks were factually incorrect. On April 11, Brennan was still stalling about the content of the review and completely ignoring any possibility it would be released publicly (though had spoken with Dianne Feinstein and Saxby Chambliss earlier that week about it). On May 1, Mark Udall got shrill, advising the President he could “excise the demons” of torture by releasing the report. On May 7, CIA was still compiling its “defiant” response to the report; National Security Council Spokesperson Caitlin Hayden told me the White House was still reviewing the document. Also on May 7, a collection of human rights organizations called on the White House to appoint someone to oversee the release of the report. 3 days later, Brennan was in the White House with a report on CIA’s complaints about the report, all written up. But here’s the thing: that meeting was May 10. It was almost 7 weeks later before Brennan would present that report (again with leaks about how inaccurate millions of CIA cables are) — in the company of Joe Biden — to Dianne Feinstein and Saxby Chambliss (though there were reports that they ended up discussing other issues instead). CIA has had its complaints all typed up for over two months now. And the only sign of any discussion about declassifying the report that describes how many lies CIA told about this program is Feinstein’s request to Jim Comey in his confirmation hearing that he would read it, why by itself seems a concession that we all won’t get to. So did the White House decide not to release the report two months ago and just never tell us all? https://www.emptywheel.net/wp-content/uploads/2016/07/Logo-Web.png 0 0 emptywheel https://www.emptywheel.net/wp-content/uploads/2016/07/Logo-Web.png emptywheel2013-07-13 07:45:512013-07-13 11:44:48What will John Brennan do, Suspend his operations? Guess you’ll just have to wait for the Conclusions and recommendations of the Committee against Torture. They were hoping you wouldn’t notice that. 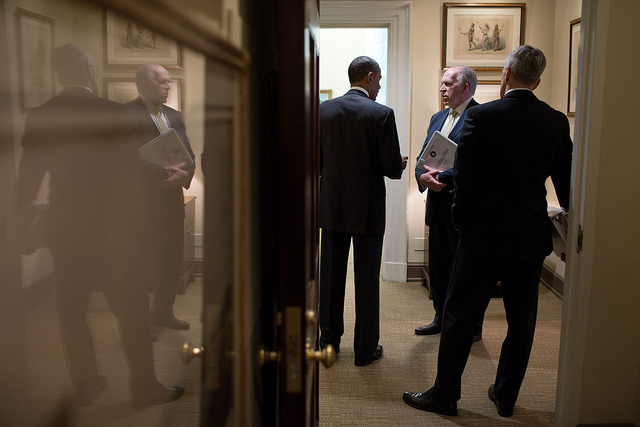 Thank you White House, for the dramatic photo of torturers, plotting how to conceal their torture. A camera can be a deadly weapon, as in “Collateral Murder”, July 12, 2007. No, no — this photo is the meeting at which they decided upon the release date. Which is “when hell freezes over.” So, yes they’ll release it but no, not yet. Minor quibble: the James Jesus Angleton I knew, thought by all in McLean to be a retired African-violet grower, puttering in his greenhouses day and night, never wept. Never. Which report would that be ? Feinstein’s report or Brennan’s report on Feinstein’s report ? The CIA is still rendering, torturing, and executing, right ? 03 July 2013: A U.S. drone strike killed at least 17 people in Pakistan’s restive border region early on Wednesday, Pakistani security officials said, in the biggest such attack this year, and the second since Prime Minister Nawaz Sharif took office.Most of those killed were fighters for the Haqqani network, according to three Taliban commanders and security officials.Two missiles hit a house near the main market in Miranshah, the provincial capital of the tribal region of North Waziristan. The region is considered a Taliban stronghold. Hey! Hey! Obama-fay! How many kids didja kill today? @Teddy: Not even from ecstasy? T.S. Eliot and Eno, the monsoons have struck a rhythm in the Sangre de Cristo, I like the ambiance being used to present this stunning portrait of the nuanced postures in the deliberations of power arising of the Obama White House. The rain just began. Has Pete Sousa been rendered to Gitmo yet? Feeling sorry for the Obama crew in the photo and for the photographer taking it. Probably went through 12 takes, and they still can’t approach “JFK and RFK contemplating the Cuban Missile Crisis”. The bar’s too high on subsequent occupants of the White House, must cause lots of anguish. I no longer feel surprise and the disdain that Obama, the executive branch, and the legislative branch feel for the American people so this revelation is more confirmation than consternation. But I want to complement you Marcy on this piece. This is an excellent, incisive and cutting. It is a great piece of writing about a terrible subject. @JohnT: It would be a pretty long list (I hope) of Presidents acting Presidential in WH photos before “Obama and Brennan plan to bury CIA ‘analysis’ of torture report”, and I’m confident the photo of JFK you have linked ranks higher. Then again, I’m pretty sure the photo you linked was taken three minutes after the one I mentioned — it’s just that JFK dropped his gum and it rolled under the desk, where RFK is trying to find it while his brother (gingerly nursing a bad back) watches. Still more inspirational than our subject photo in this post, though. funny that my tho’t on viewing the picture was that they were meeting in the hall with the hope that general alexander’s booz allen minions wouldn’t overhear them.